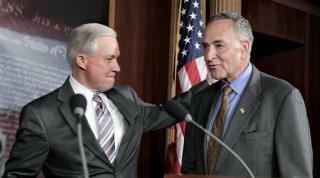 (Newser) – Sen. Jeff Sessions, Donald Trump's controversial pick for Attorney General, has been accused of racism—and incoming Senate Minority Leader Chuck Schumer has concerns. "Given some of his past statements and his staunch opposition to immigration reform, I am very concerned about what he would do with the Civil Rights Division at the Department of Justice and want to hear what he has to say," Schumer said in a statement, per Politico. The Democrat added that Sessions may be a fellow senator, but that doesn't "absolve him from answering tough questions in the confirmation process." Schumer is politician to his very core. I have watched him and his portable podium traverse New York State for most of my adult life, he has accomplished absolutely nothing. Schumer is not so worried. America is going to go from leading the world in civil rights to being lectured by it. Trump may, possibly, usher in Smoot-Hawley style tariffs ushering in a second depression. But that will be so completely and totally minor compared to failing to provide leadership on climate change, setting the tone that science isn't real, and ushering in the extinction of man-kind. There's a reasonable chance there won't be any human beings left in 150 years. And Tump will be a leading cause.